Thanks to everyone who came out to enjoy the opening night of HIFF 2018! It was great to see such a good turnout and engaged audience. A special thank you to our hardworking volunteers, from Camila who put together the program guides, to Tyson and Mi Young who helped set everything up at Neptune, to Camila, Tamar, Tynan, Blossom and Carter who kept the delicious popcorn flowing! Tonight includes a screening of the documentary feature In The Waves,at 7pm which was filmed in Cape Breton over the course of several years. Filmmaker Jacquelyn Mills recommends you bring a grandparent (or grandchild) to enjoy the film with you. She will also be at the screening for a Q&A. Next at 9pm, join us on a short trip from Neptune to the Bus Stop Theatre on Gottingen Street for a special short film screening of her silent life. followed by an expanded cinema film performance! AFCOOP’s Artist-In-Residence Lindsay McIntyre has prepared the film performance while she has been in Halifax in May and June. Two local artists Lindsay has been mentoring, Rena Thomas and Melissa Mackay, will also present new works at this event. After the shows, please join us up the street at the AFCOOP office for a free tropical themed party with DJ Douvet and brews from our friends at Good Robot. Everyone is welcome! Three generations of women are revealed in this intuitive journey into one family's past. Crafting together analogue film techniques with personal interview, director Lindsay McIntyre creates an impressionistic exploration of her mixed Inuit heritage and the controversies surrounding her ancestry. PASSES: If you still need to pick up your HIFF Festival Pass, it'll be in the lobby of the Neptune's Scotiabank Stage Theatre 60 minutes before showtime. A few passes are still available for purchase. TICKETS:Tickets can be purchased online at any time, or at the door 60 minutes prior to each showtime for $12. Lindsay McIntyre’s film performance is $5 at the door. TOTE BAGS:This year we have some gorgeous tote bags available for $10. They’ll be on sale in the Neptune lobby prior to or in between screenings. We also have a few vintage HIFF t-shirts available for $10. CONCESSION:Arrive early to snag your free popcorn in the lobby at Neptune. Good Robot Brewing will a special HIFF Feature at Neptune’s bar. New this year: you’re allowed to bring your drinks into the theatre with you! The film performance at the Bus Stop will be a dry event. Free snacks and drinks will be available at the AFCOOP party! SOCIAL MEDIA: Huge thanks to everyone who has been posting and helping us spread the word on social media! We're a small festival so it really makes a difference! Please keep using hashtag #HIFF2018 and tagging us on Instagram, Twitter and Facebook. If you would like to post a photo which includes the face of another person, please ask that person before posting. Neptune's Scotiabank Stage Theatrehas wheelchair accessible entrances, seating, and gendered washrooms. If you have any other accessibility related questions or if you'd like to pre-arrange assistance, do not hesitate to call the Neptune Box Office at(902) 429-7070 or reply to this email. The Bus Stop Theatre has an accessibility ramp to enter the building and accessible gender neutral washrooms. AFCOOP is located on the main floor of 5663 Cornwallis St. There are two concrete steps leading up to our main entrance. There is a gender neutral bathroom located inside our office space. 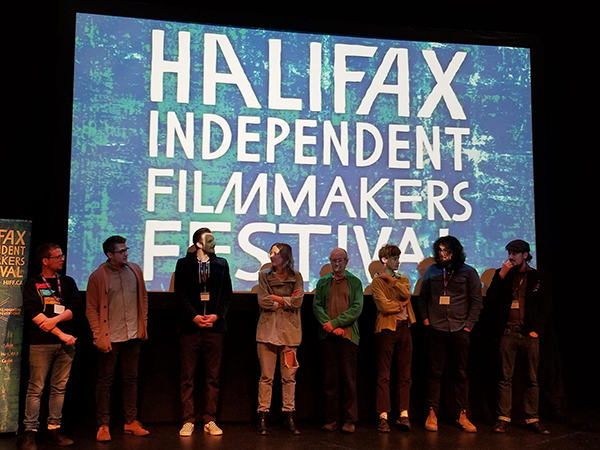 SAFER SPACES: The Atlantic Filmmakers Cooperative (AFCOOP) and Halifax Independent Filmmakers Festival (HIFF) Safer Space policy is intended to help create a supportive, non-threatening environment at HIFF 2018. AFCOOP is currently undergoing an extensive review of our processes and Code of Conduct, and in the interim will operate in accordance to this policy. AFCOOP wants to ensure our visitors, members, and staff feel safe, welcome, and comfortable in our spaces, on our film sets, and at our events. We require a respectful environment at all times, and will not tolerate discrimination or harassment in any form. This includes but is not limited to: racism, sexism, ableism, transphobia, queerphobia, homophobia, sizeism, ageism, xenophobia, sexual harassment, or violence of any kind. We encourage anyone who experiences or witness violations of this policy to speak with identified safe volunteers or AFCOOP staff (identified by wearingsafe buttons) who will address the situation, and provide support and further resources. We are striving to be survivor oriented and our response will be to support the survivor. If you are found violating our policy, you may be asked to leave the space. If this should happen, we ask that you respect our policy and self-exclude yourself from the event. It is AFCOOPs responsibility to follow up with persons involved in an incident, and an appointment can be made with our director Martha Cooley or a board member after the festival is over. We understand that survivors may have hesitation about attending public events or visiting our spaces, if so please feel free to contact Ruby Boutilier (Safer Spaces Committee chair and board member) rubysue241@gmail.com and we will make every effort to support your participation. About HIFF: HIFF is a boutique festival dedicated to showcasing bold, innovative film and media art from the Atlantic region and around the world. The festival includes screenings, receptions, celluloid installations and one-on-one meetings between local filmmakers and guest programmers from Canadian and International festivals. HIFFis produced by the Atlantic Filmmakers Cooperative with the generous support of The Province of Nova Scotia, Arts Nova Scotia, Canada Council for the Arts, Canada Department of Heritage, City of Halifax, Telefilm Canada, Screen Nova Scotia, The Coast, and NSCAD University. ABOUT AFCOOP: Established in 1974 the Atlantic Filmmakers Cooperative (AFCOOP) is a non-profit, community organization dedicated to supporting the production and presentation of independent film and moving image-based work in a collaborative, learning environment. AFCOOP operates with generous support from the Canada Council for the Arts, the Province of Nova Scotia and the City of Halifax. Festival Update #3: HIFF Begins today!